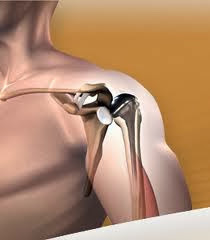 Patients with shoulder joint disease may have shoulder pain accompanied by functional limitations, Conservative treatments for shoulder joint problems include physiotherapy, drug treatments like pain relief and topical or oral non-steroidal anti-inflammatory drugs corticosteroid injections. Patients not responding to conservative treatments may require surgery, which may be either shoulder arthroplasty using a stemmed humeral head prosthesis, or fusion of the joint. It's a condition that causes “wear and tear” to your joint cartilage and develops after years of constant motion and pressure on the joints. It is a chronic joint disease that can attack any or all joints in the body. It can strike at any age and affects more women than men.By inflammatory arthritis the joint may become red and swollen, and pain may radiate into the neck and arm. The bone also may be destroyed. It's a combination of shoulder arthritis and a massive irreparable rotator cuff tear. Arm can fracture for a variety of reasons. but it's difficult and become more common in persons around the average age of 60 as they become more prone to osteoporosis. Avascular necrosis is a disease in which there is a temporary or permanent loss of blood supply to the bone. If non-surgical treatment options such as medication, physical therapy or lifestyle changes fail to provide relief, your surgeon may recommend a surgical treatment, including shoulder replacement. Cost of shoulder replacement surgery in India is low and affordable than western countries, it is an ideal solution for those who are unable to pay the exorbitant costs of the surgery in their own country. Dr.Raju Easwaran, one of the best orthopaedic surgeon in New Delhi offers Shoulder Replacement surgery in India at affordable cost. Joint preservation concerns with the restoration of the normal function of the joint, may be it knee, hip or the shoulder. The technique is an emerging as a better option for joint replacement procedure. The procedure is reliably employed as a way to prevent or delay the onset of osteoarthritis, the most common form of arthritis. Relatively younger patients are seen to take benefit from this mode of treatment. Couple of years ago, joint replacement was the procedure that captured the attention. Many patients successfully tried this procedure. Majority of them was middle aged. However, the relatively younger patients experienced some serious problems after this treatment. With the development of joint preservation, the problems of the younger patients were addressed to a considerable extent. Considering the hip joint preservation, peri-acetabular osteotomy(PAO) has yielded positive results. Osteotomy is the surgical removal of the bone. The removal of surrounding bone portions of hip socket (acetabulum) is called peri-acetabular osteotomy. The method can be used to treat hip dysplasia. A number of angular cuts are made on the pelvis. This separates the hip socket from the pelvis, thus resulting in the free socket rotation in 3 dimensions. The pelvic ring stability is thus preserved. Prior to the surgery, a preoperative planning of PAO is done. The planning aims to make an appropriate pelvis model. With the help of this model, the reorientation of the hip socket is planned. The advantages of PAO are many. The primary plus point is a much larger weight bearing ability of the hip. Females who undergo this surgery can have normal vaginal deliveries rather going in for the cesarean delivery. The rehabilitation period is almost 6-8 weeks and is continued until some recovery signs in the osteotomy site are seen. Weight bearing can be increased slightly. Nearly every patient will be able to walk after a period of 3-4 months. Joint preservation is a new way to restoring normal and pain-free function to the knee, hip, and shoulder joint.. If you are having any joint pain in your hip or your knee, it's important to seek medical attention. Dr. Raju Easwaran specializes in providing comprehensive sports medicine services including the diagnosis and treatment of athletic injuries. He specialises in techniques to preserve damaged and injured Hip and Knee joints.